CZL Consolidated (ASX:CZL) is in by no means winding down before the end of the year. It’s got multiple drill rigs on site as you read this, targeting 16 holes over 2,390m of zinc drilling. This ASX explorer remains capped below $10M, and that’s when our team here at The Next Mining Boom get very interested indeed. We first brought you CZL earlier this year via our article, Boutique ASX Zinc Explorer on Cusp of Production , where we laid out the case for having a closer look at this early-stage, boutique player with zinc-lead grades as high as 60% (that’s right, sixty per cent). And it’s not just zinc CZL has been hitting. 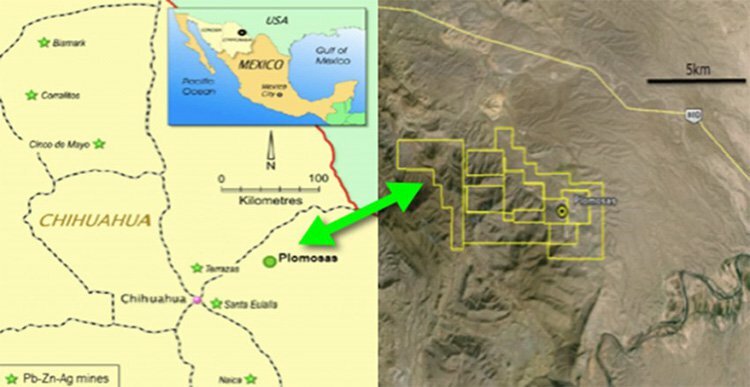 Over two million tonnes of ore with a zinc + lead grade averaging 22% as well as an average of 2 oz./tonne of silver has been extracted from its Plomosas project in the past. The mineralisation appears to continue at depth with over 6km of prospective strike within CZL’s tenement package – which means there’s potentially plenty more high grade zinc for CZL’s picking. And judging by CZL’s recent exploration, the Plomosas Project is likely to keep on giving. The early stage exploration target is for 2.9Mt – 3.2Mt at grades of 15% – 20% zinc-lead. However, this target is conceptual in nature and CZL will need to test its potential resource with the drill bit before coming up with a JORC resource. CZL already has a processing facility on site which means minimal delay in getting its ore processed and shipped for sale. The Company wants to start generating cash flow as soon as possible and the plan is to start proceedings with a conservative 200 tonne per day operation. Like all plans for small cap explorers, nothing is a guarantee, and CZL is a speculative stock – its recommended investors do their own research and seek professional advice before investing. CZL is looking to complete its drill campaign in the coming weeks, and move straight into a Scoping Study, with its eye firmly on near term production. ...which leaves the path clear for CZL to secure its JORC Resource, move to a Scoping Study and with a bit of luck, push its paltry $8M market-cap a tad higher. 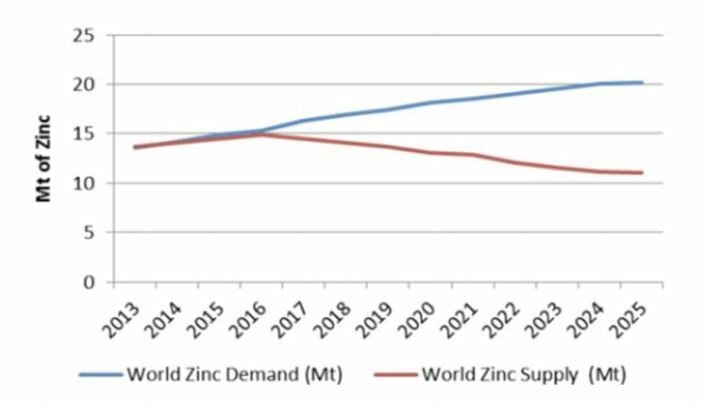 Most timely of all for CZL, is the 500,000 tonne deficit in zinc supply expected to hit in 2016 that has the potential to secure a very lucrative operating space if higher prices eventuate on the back of supply bottlenecks. Consolidated Zinc (ASX:CZL) has quietly gone about teeing up its zinc play since acquiring its cornerstone Plomosas Project earlier this year . Covering 30 sq. km. and 11 exploration licenses within Mexico’s Chihuahua province, CZL holds a 51% stake which is likely to increase to 80% before production commences. Mexico was ranked fifth in the world for mining investment and sixth in the world for zinc production in 2013. It’s a world class mining province with proven past production at high grades. The last miner on this ground was ASARCO Group Mexico which operated here until 1974, extracting 2.2Mt of ore with 16% Zn, 8% Pb and 60 g/t Ag. The added benefit for CZL is that foreign investor participation or ownership is completely unrestricted which adds a layer of operational security to Plomosas. 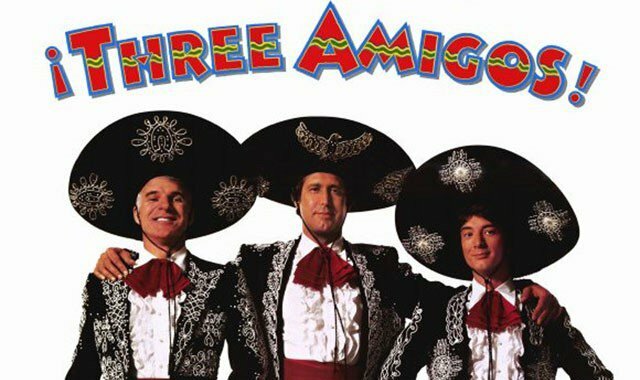 What do these three amigos have to do with zinc production? Aside from being a cult-classic Hollywood movie filmed in Mexico that grossed almost $40M, The Three Amigos is also the name of CZL’s new Mexican prospect that could also gross a dollar or two, if proven up and added to its CZL’s JORC Resource. After its restructuring and acquisition of Plomosas earlier this year, CZL quickly identified an entirely new footwall of mineralisation it dubbed ‘Tres Amigos ’, (The Three Amigos). CZL knows that very high grade metals mineralisation is present at Plomosas, not only from previous mining, but also, from its own initial exploration. Returning grades of 24.2% zinc, 0.80% lead and 13.3g/t gold, CZL’s samples were even considered too high for standard assaying when sent for laboratory testing. Circled in red, is a combined zinc-lead grade of 59.79% – that’s among the highest seen anywhere in the world. By CZL’s own admission, Tres Amigos represents a compelling opportunity to develop a brand new standalone resource given the bonanza grade results seen here. If this newly discovered zone continues to yield exploration results as have been received recently, CZL could move to complete a Scoping Study on Tres Amigos as a standalone development opportunity. It’s still early days, but this is the kind of development that has the legs to lift CZL’s market valuation and generate cash flow for further exploration. Taking all things into account, CZL has got its hands on a near term production asset – which means the company is squarely on the fast track. The only other aspect required for CZL to continue its exploration, obtain a JORC Resource and move to producing around 200tpa is an estimated $1M to upgrade existing processing facilities at Plomosas. But the good news is that CZL has an old-hand in its corner, by the name of well-known resources investor Stephen Copulos. Mr. Stephen Copulos, owner of the ‘Copulos Group of Companies’, is Australia’s second largest KFC franchise owner. 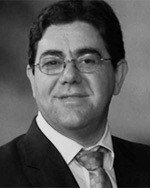 He has over 30 years’ experience in business and investment with over 16 years’ experience as a company director of both listed and unlisted entities. He is currently Chairman at CZL, taking a strategic role and guiding the company to success. He is also a major shareholder in other ASX-listed companies, Crusader Resources (ASX:CAS) and Black Rock Mining (ASX:BKT). With large institutional support, including Mr. Copulos, CZL has heavyweights in its corner which it recently leveraged to secure $1M in funding. 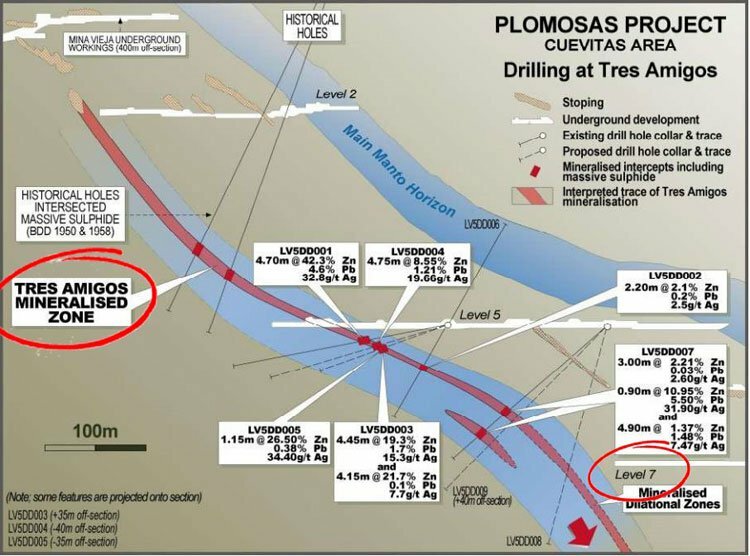 CZL tapped The Copulos Group for a $1M drawdown facility in order to fast track the drilling programme at Plomosas, in exchange for 3 million CZL shares. It helps to have friends in high places. $500,000 was made available immediately with a further $500,000 ready to be deployed to ensure all necessary exploration is completed to allow CZL to finalise its JORC Resource and Scoping Study. CZL is anticipating a JORC compliant resource this quarter, with a Scoping Study early next year. ...and the results have been heart-warming to say the least. CZL’s commercial plan has gradually become two-fold. Initially, CZL was only planning to explore at depths further than 280m, focusing on Level 7 and deeper. However, the bonanza results seen at Tres Amigos sets the stage for both a larger total resource for CZL, as well as higher mineralisation grades on average. That’s a great development for a company capped at just $8M, and why we think it’s a strong zinc play all things considered. At the same time, success is no guarantee here – it’s a small company, a speculative stock, and there are a few hurdles to jump over before the company starts to generate cash flow. If we compare how CZL’s Plomosas project stacks up to other developments around the globe, you can see it’s all about quality rather than quantity. Despite earmarking a tiddly 3Mt for a contained Zn tonnage of 360,000t to start off with, CZL plans to ramp up its overall resource size over time. The good news is that the mineralisation already seen makes that expansion all the more likely. Now, the key for CZL is to fast-track its exploration on both Tres Amigos and below Level 7 in order to unify their prospects into a beefy JORC Resource that will lift its valuation. If and when a JORC Resource is proved up, CZL is aiming to enter an industry that is widely expected to face bottlenecks on the back of limited supply and growing demand. And what could have caused such a diverging supply and demand picture? 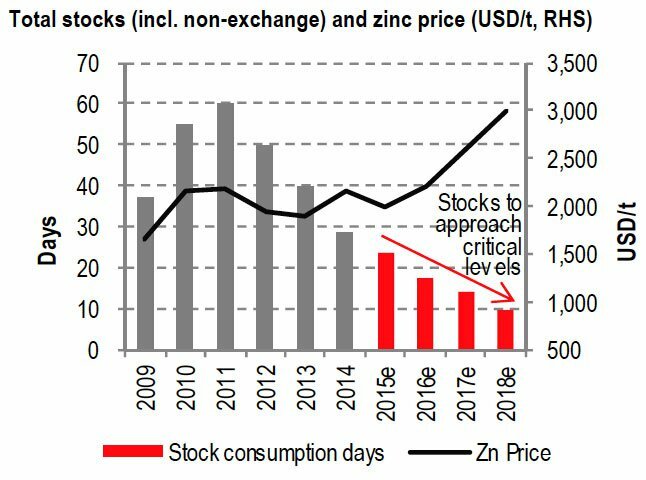 Glencore’s decision to cut 500,000t from its annual production schedule (around 5% of global supply) has jolted the zinc market in an upward direction, and, given zinc explorers fresh impetus to get their projects in order before 2016 in order to take advantage of rising demand, falling supply dynamics. You couldn’t ask for better market fundamentals. Other mines including MMG’s Century mine in Australia and Vedanta’s Lisheen in Ireland have already closed earlier this year, further cutting world zinc supply. According to the International Lead & Zinc Study Group , the global zinc market is expected to swing to a deficit of 152,000 tonnes in 2016 from a surplus of 88,000 tonnes in 2015, as reductions in mine supply outside China are likely to curb output. For the latest ILZSG monthly estimate, click here . Meanwhile, ANZ analyst Daniel Hynes says , “This will most surely plunge the market into a much greater deficit in 2016 and provide some much need support for prices over the coming 12 months”. ...now, the next checkpoint on CZL’s journey is to obtain its Stage 1 JORC Resource sometime between December 2015-January 2016 with a Scoping Study running in parallel for delivery in February/March 2016. As most readers of The Next Mining Boom will know, as explorers move closer to attaining a JORC Resource, the preceding few months can often be very news flow heavy, and therefore, have a habit of serving up price catalysts upon publication of exploration results. Considering CZL’s grade has been off the charts and required secondary testing in the past, it’s definitely a stock whose news flow is worthy of keeping on your radar. By focusing on a high-grade project, CZL is undercutting the bigger fish in the zinc mining world. With a market cap of $8.5 million, it represents a low-cost exposure to some of the highest zinc grades on earth. That being said, we don’t have a crystal ball, so cannot predict what the future holds for CZL – success at Plomosas is no guarantee and like all small cap exploration stocks, this is a speculative investment. CZL’s plan is to get production going on a limited scale, and then use the cash from that to fund its dreams of unlocking the resource under Level 7. CZL also has solid news flow coming in the next six months as it works up to a maiden JORC resource. The reality is that any one of its individual exploration announcements has the potential to get this stock moving northwards because of the impending JORC Resource, existing processing facility and cusp of production status. 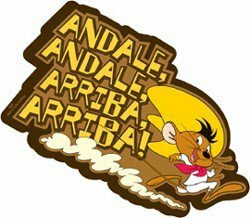 CZL is moving as fast as Speedy Gonzalez to get its production line sorted in view of a likely zinc market supply shortage next year – a piñata CZL just can’t wait to have a swing at. 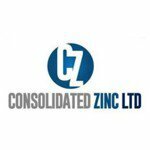 Zinc JORC Resource within weeks for CZL?